Rex Burkhead knew he had to make the most of the opportunity he waited four years to get, especially with his future up in the air. The fourth-year Cincinnati Bengals running back earned his first career start Sunday with Jeremy Hill inactive and quickly proved he belonged. Burkhead, who is a free agent this offseason, enjoyed a career day with 119 yards rushing and two touchdowns on 27 carries to lead the Bengals to a 27-10 win over Baltimore in the season finale at Paul Brown Stadium. The Ravens had the second-best rush defense in the league. Since Giovani Bernard tore his ACL on Nov. 20 against Buffalo, Burkhead has been the team’s most effective rusher, but he was still playing behind Jeremy Hill until a knee injury limited Hill’s production in a 12-10 loss to Houston on Dec. 24. Burkhead had 186 yards on 41 carries in his last five games before Sunday, including 12 carries for 42 yards at Houston. He had 54 yards on 11 carries in the first half against Baltimore. Burkhead’s first carry went for 17 yards, and it was smooth-sailing from there. He put the Bengals on the board that first drive, scoring on a 5-yard run and dive to the end zone for his first score of the season and just his second career rushing touchdown. The last time Burkhead had more than 20 carries was while playing at Nebraska. The Bengals took him in the sixth round of the 2013 draft, and he saw action on offense in just 10 games combined his first two seasons. He had four carries last year and began this season in a bigger role on special teams with Cedric Peerman out. Burkhead also capped off the scoring with a 5-yard run behind Ryan Hewitt’s block with 2:20 left. Including his 25 yards receiving, he finished with 144 yards from scrimmage in his first 100-yard rushing performance. 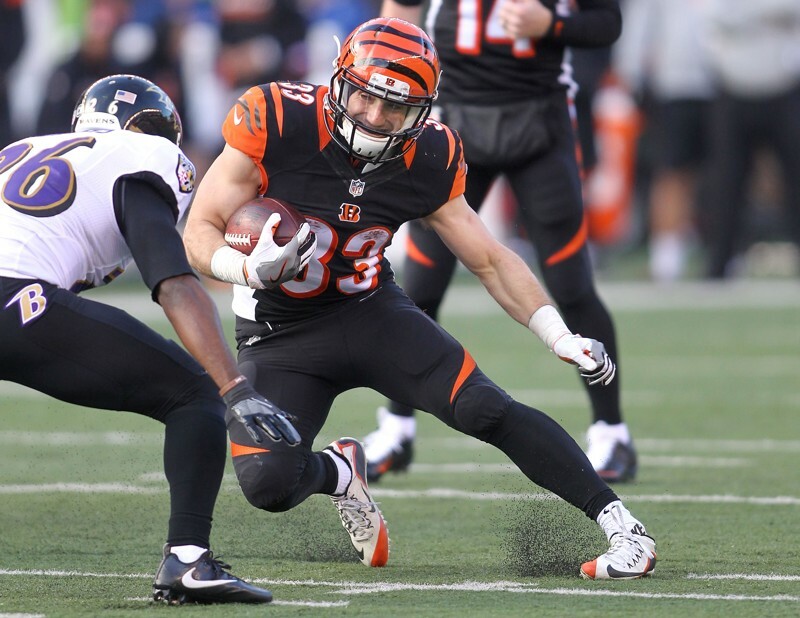 Hill and Bernard are both set to return next season, but Bengals coach Marvin Lewis said “there is no question” Burkhead is a guy he would like to have going forward.